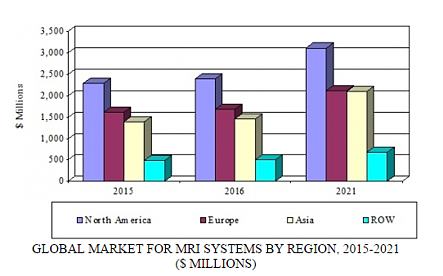 Developing nations focused on investing in healthcare infrastructure are expected to spur growth in the global market for medical magnetic resonance imaging (MRI). A BCC Research analysis revealed that countries such as China, India, Brazil, and those in the Middle East represent opportunities for market expansion. MRI uses magnetism, radio waves, and a computer to produce images of body structures. MRI scans have a wide range of applications in disease diagnosis, including in such areas as neurology, cardiology, and hepatology. According to BCC Research’s analysis, the global market for medical MRI should reach nearly $6.1 billion and $8 billion in 2016 and 2021, respectively, showing a five-year compound annual growth rate (CAGR) of 5.7%. The North American market is forecast to approach $3.1 billion in 2021 at a five-year CAGR of 5.4%. The Asia-Pacific region is predicted to account for nearly $2.1 billion in 2021, reflecting a five-year CAGR of 7.3%. Asia is projected to be the fastest-growing area as a result of its growing healthcare infrastructure and the increasing penetration of MRI in this region. India and China are likely to represent huge growth potential for MRI systems. MRI is most widely used for the spine (23%) and brain (22%), followed by extremity/musculoskeletal MRI (16%) and vascular and cardiac MRI (15%). As MRI systems expand into new markets and establish wider penetration, more growth is expected in these established MRI applications. Advances in MRI technology have resulted in increased availability of MRI by reducing the size of the unit. A groundbreaking miniature MRI scanner to improve diagnosis and treatment of brain damage in premature babies is being tested in Sheffield, England. One of only two in the world, the prototype scanner was developed through a collaboration that included Sheffield Teaching Hospitals NHS Foundation Trust, the University of Sheffield, GE Healthcare, and the Wellcome Trust. A scanner has also been tested in the United States. Sheffield Teaching Hospitals, January 23, 2017. Paul Griffiths and Martyn Paley, both of whom are professors at the University of Sheffield, have been working on the concept and design of the scanner for 12 years. The prototype machine is part of a two-year research project on the feasibility and benefits of scanning babies in the neonatal unit. MRI scans are rarely performed on severely premature babies because the risks involved in transferring and handling a vulnerable infant can outweigh the benefits. Because it is considerably smaller than a standard MRI scanner, the prototype unit avoids having to transport babies elsewhere (e.g., another department or even a different hospital) to perform the procedure. It also means that MRI scans can be done faster, while providing more detailed clinical information than a bedside ultrasound scan. At present, ultrasound is normally used to scan the brains of newborns. Griffiths said MRI showed the structures of the brain and any abnormalities more clearly. The next step would be to do a trial in premature babies to show definitively that MRI produces a better diagnosis and whether it altered the clinical management of children (BBC). If the research is a success, and the quality of the images and data and clinical benefits are proven, it is hoped that the scanner will be approved for routine clinical use. So far, approximately 40 babies have been imaged in the MRI scanner, which was built by GE Healthcare with funding from the Wellcome Trust. It is not known how much a neonatal MRI machine would cost should the system eventually become commercialized. The prototype neonatal scanner exemplifies continuous product development and technology advancement—both of which are key growth factors for the global medical MRI market. Rapid progress in the field of medical diagnostics and the aging population worldwide, along with increasing access to healthcare and greater affordability, are also among key drivers. Other growth factors include the rising incidence of diseases and upcoming replacement opportunities in saturated markets. Improving socioeconomic conditions in emerging regions and substantial investments by their governments in building and enhancing healthcare infrastructures have increased the demand for medical imaging systems. However, the high cost of equipment and market challenges, including regulatory and reimbursement issues, are likely to hamper growth. BCC Research’s study, Medical Magnetic Resonance Imaging (MRI): Technologies and Global Markets, analyzes MRI systems, technologies, and industries by region. Global market drivers and trends, with data from 2015, estimates for 2016, and projections of CAGRs through 2021, are provided.